You can find basic understanding DNA research, in my previous post “R1a vs. I2a [Y-DNA]“. In fact it’s about person belonging to haplogroup, from geographic point of view. But this article si about more detailed Y-DNA research closer to my own haplogroup. The key haplogroup is I-P37, and this is main flow chart/diagram by Ken Nordtvedt created in 2013 and shows how I-haplogroup people migrated. We can see, that there were a few directions in migration process. Here is 2010 year map, how this all visualized. There are many aliases for dozen of SNPs. Despite the fact that these aliases are complicated to remember, and had been changing all the time in past, I really like hierarchy, which classify data in more consistent way. This list is about to understand basic aliasing, with some variations. I2a1b2a1 – according ISOGG-2014, ISOGG-2015, ISOGG-2016. I2a1b2a1a – according ISOGG-2017 (after Aug-2017 update). 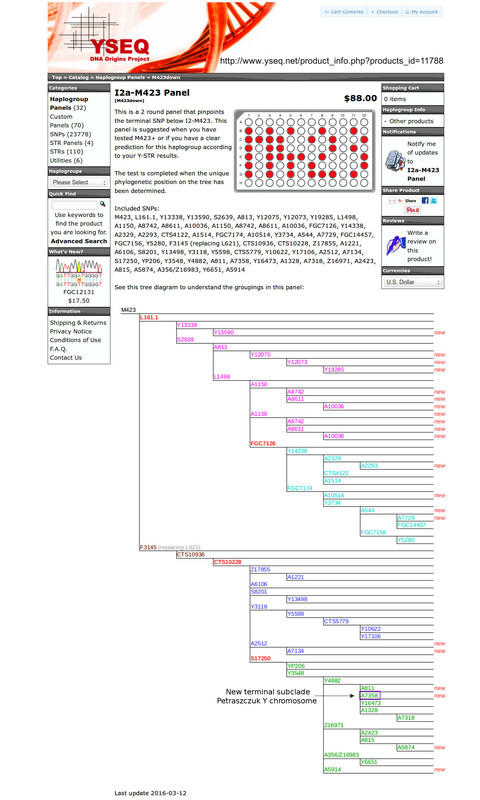 I2 \ I-CTS10228 – according YFull tree. Note: In aug-2017 ISOGG updated tree names, but it also changed some names, due to the fact, that middle branches appeared. For example: before Aug-2017, Y4460 had a name “I2a1b2a1b” and now it’s “I2a1b2a1a1b“. 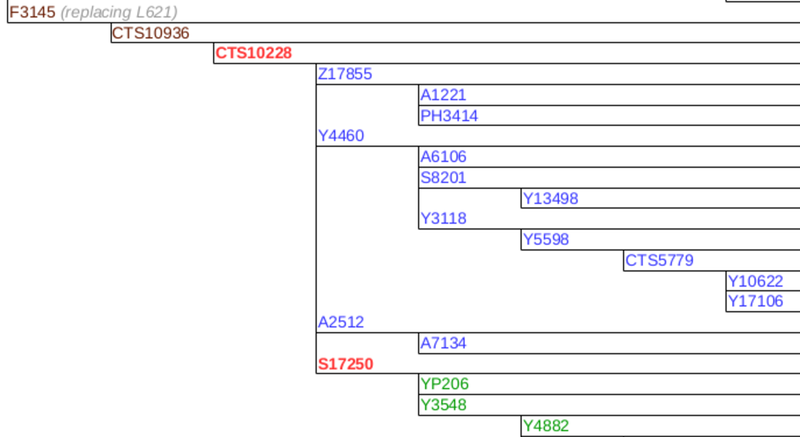 Note: In Jan-2018, I noticed, that Y18331 is represented on ISOGG tree, when YFULL represents that subclade with A2512. IJ M429 30.5-46.2kya Ancestral HGs IJ-M429* probably would have entered Europe through the Balkan track sometime before the LGM. They then subsequently split into Hg J and Hg I in Middle East and Europe in a typical disjunctive phylogeographic pattern. I M170+ 15.3-30.0 kya Predominantly a European haplogroup and it is considered as the only native European Haplogroup. It can be found in the majority of present-day European populations with peaks in Northern and South-Eastern Europe. Aurignacian culture (32–26 ka). I2 M438+ 28kya Last Glacial Maximum (LGM) which lasted from 26.5 ka to 19 or 20 ka. I2a L460+ 11kya Concentrated in eastern Europe and western Russia, reaching levels of 40% in Bosnia and 30% in Croatia. Balkans. I2a1 P37+ 10.7±4.8kya Two examples of I2a1 have been found in the DNA of Neolithic farmers. They were among the burials in the Cave of Treilles in Aveyron, in the South of France. The Treilles culture of c. 3000 BC is the very last phase of the Neolithic in the region before the arrival of copper-workers and the Bell Beaker culture. I2a1b M423+ 8.8±3.6kya Dinaric, Disles, Isles. formed 11300, TMRCA 6500 The high concentration of I2a1b-L621 in north-east Romania, Moldova and central Ukraine reminds of the maximum spread of the Cucuteni-Trypillian culture (4800-3000 BCE) before it was swallowed by the Indo-European Corded Ware culture. I2a1b2a CTS4002, Y3110+, formed 6500, TMRCA 5500 Not tested, but 99.99% sure, that I positive. Because it’s in between. aka L147.2 formed 5500, TMRCA 2200 My officially assigned SNP by FTDNA. It describes many Dinaric DNA bearers. During 2015 year it’s expanded into a few different branches. people I-L621 L147.2 CTS5966+ which are a remains of Venedi Peoples from Roman Empire period (see the location of the Venedi in the upper Vistula region and south of Polesian Lowland in times of the Roman empire under Hadrian (ruled 117-138), source Vistula_Veneti. I2a1b2a1b1 S17250– TMRCA 2100 Negative for me. Current locations of tested people: BLR/UKR/CZE. The higher percentage of I2a-Din in the south is probably just due to another founder effect due to the fact that the South Slavs originated in western Ukraine, where the ratio of I2a to R1a was higher. 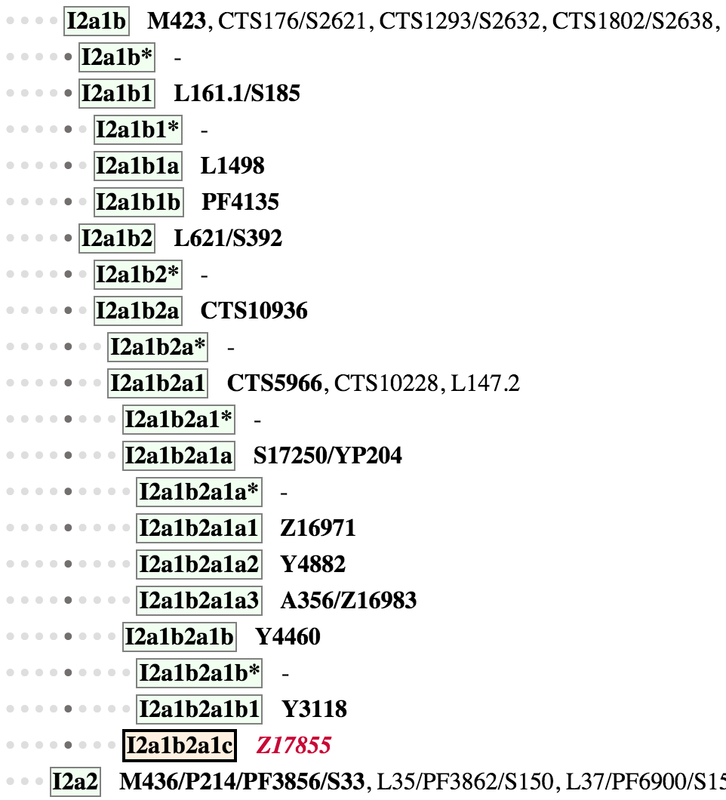 Virtually all Dinaric I2a falls under the CTS10228 (aka CTS5966 or L147.2) subclade, and the majority to the S17250 ramification, who descend from a common patrilinear ancestor who lived only 1,800 years ago. I2a1b2a1b2? Y4460+ (inside of Y3120) TMRCA 2200 Age: 1991 ybp. Positive for me. 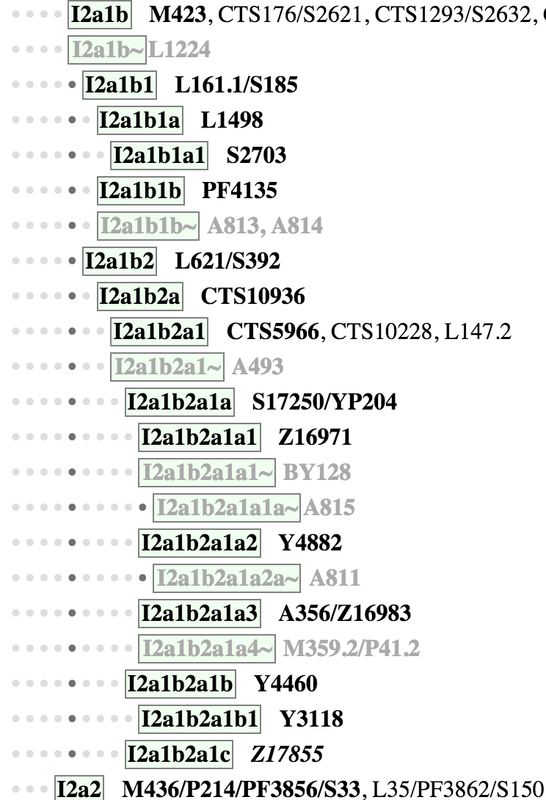 Most modern Eastern Europeans belonging to I2a1b fit into the L147.2 (aka CTS10228, CTS2180 or Y3111) subclade, which is thought to have arisen 5,600 years ago (just before the Yamna period and the Trypillian expansion into the steppe), but has a TMRCA of only 2300 years according to Yfull. The minority of I2a1b-L621 individuals negative for L147.2 are all found around eastern Poland, Belarus and western Ukraine, suggesting that this is where this lineage survived since the Chalcolithic. 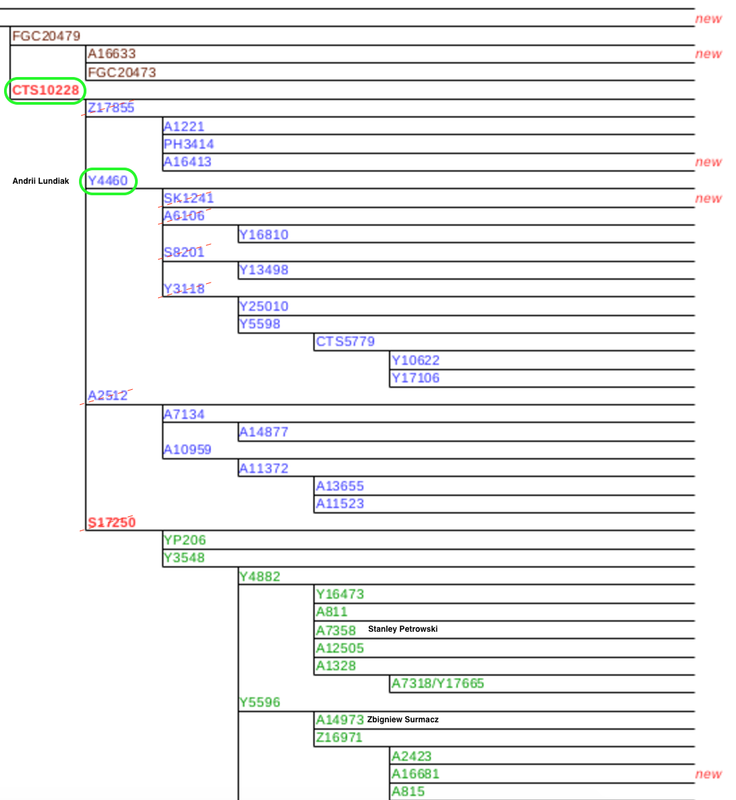 The I2a1b-L147.2 subclade seems to have expanded very fast from 1900 years ago, which is concordant with the timing of the Slavic ethnogenesis, considering that it takes a few centuries before one man can have enough male descendants to start having an impact at the scale of a (small but fast-growing) population. I2a1b2a1b2a? Y3106? B57+ TMRCA Age: 1963 ybp. TMRCA: 2200. Not yet tested, but ordered B57 on YSEQ. I2a1b2a1b1b1? Y16810 TMRCA 1800 Age: 1815 ybp. Not tested, but probably negative. YFULL reported locations: UKR, LVA. 1800 Age: 2347 ybp. Age formula the has similar year range/deviation as for Y16810. I2a1b2a1b1a? S8201– TMRCA 1450 Age: 1443 ybp. Negative for me. YFULL reported locations: UKR, BLR. Y31845? TMRCA 1450 Age: 1894 ybp. YFULL reported locations: HUN, RU. Negative for me. I2a1b2a1c Z17855– TMRCA 1650 Age: 1626 ybp. Negative for me. YFULL reported locations of tested people: UKR. Based on map by Krzysztow most of tested people are from Balkan countires (Bulgaria, Macedonia, Romania, Bosnia, Croatia). Haplogroup I-L460 (I2a) is presented at levels 21.9% according to 808 Bulgarian male samples of the largest-scale study from 2013. By higher levels are defined the profiles of Ukrainians and all South Slavs other than Slovenians. 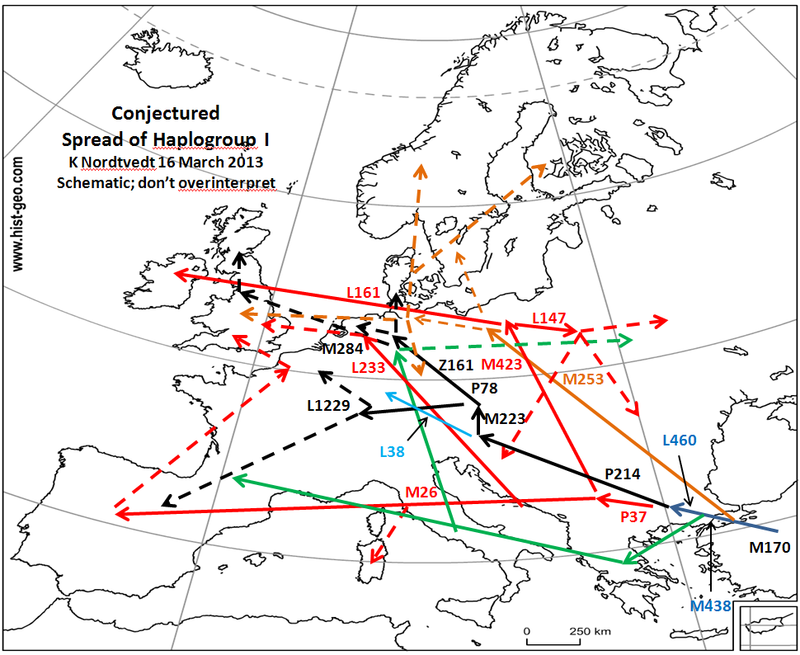 Evidence points to European origin for macro-haplogroup I, and Levantine for its immediate ancestor- IJ. Its exclusive and now patchy distribution within Europe suggested a very early entry in to Europe during Palaeolithic colonization, which was confirmed by the lack of its ancient DNA outside of the continent and ~13,000 years old European Cro-Magnon remains belonging to I2a. 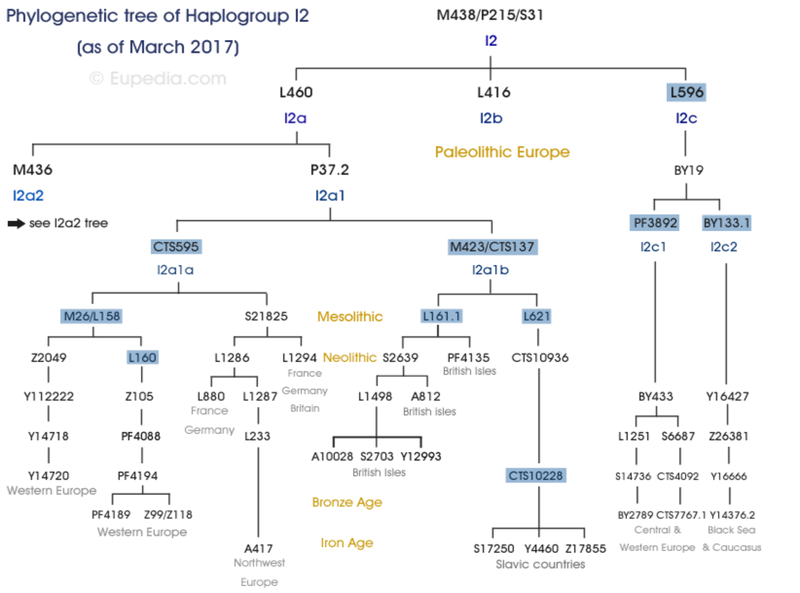 I2a2 is the most frequent haplogroup of European male remains dated to the Metal Ages, while I2a1 and I2a1b are most common on Mesolithic remains, as such they were the primary haplogroups of pre-historic European hunter-gatherers. Initially a Holocene expansion of I2a in Southeastern Europe is supposed; however Dinaric is descended by several ‘only child’ sublclades and it is suggested that its most recent common ancestor is aged only 2200 years (yfull.com) making it the youngest and most common micro-group. I2a is recorded to be the dominant haplogroup in the former Sofia-city, Sofia, Plovdiv and Varna province between 23-33%, dropping under 10% in central Bulgaria. Bulgarian Hg I2a most often belongs specifically to the P37.2, M423 branch (“Hg I2a1b“), representing 20% of Bulgarian males. According to some data, Bulgarian males who belong to M423, belong to CTS10228 Dinaric (I2a1b2a1), the prevalent clade in eastern Europe, and none of them belongs to the Disles L161 branch or the CTS595 branch found in west Europe and Sardinia. It makes up an absolute majority among the highest populations. Many authors claim that the higher ratio of I2a1b over R1a that is observed in the Balkans today is the founder effect and was present before the Slavic expansion, owed to indigenous tribes, and especially for the highest frequency in the Western Balkan area where Dinaric-South haplotypes prevail. However, the largest haplotype group among Bulgarians is Dinaric-North (75%), which is prevalent among all North Slavs and may suggest a recent migration north of the Danube river. Anyway, any evidence for such migration is yet not observed in connection to modern populations as more than 90% of the traced Dinaric-North Bulgarian haplotypes belong to the SNP group Z17855, being the prevailing clade in Bulgarians, somehow significant in the western Balkans and rare elsewhere observed. These SNP groups separated before the Slavic expansion in the Balkans. Some authors suggested that I2a-Dinaric is pre-Slavic in the region and owed to the Thracians. 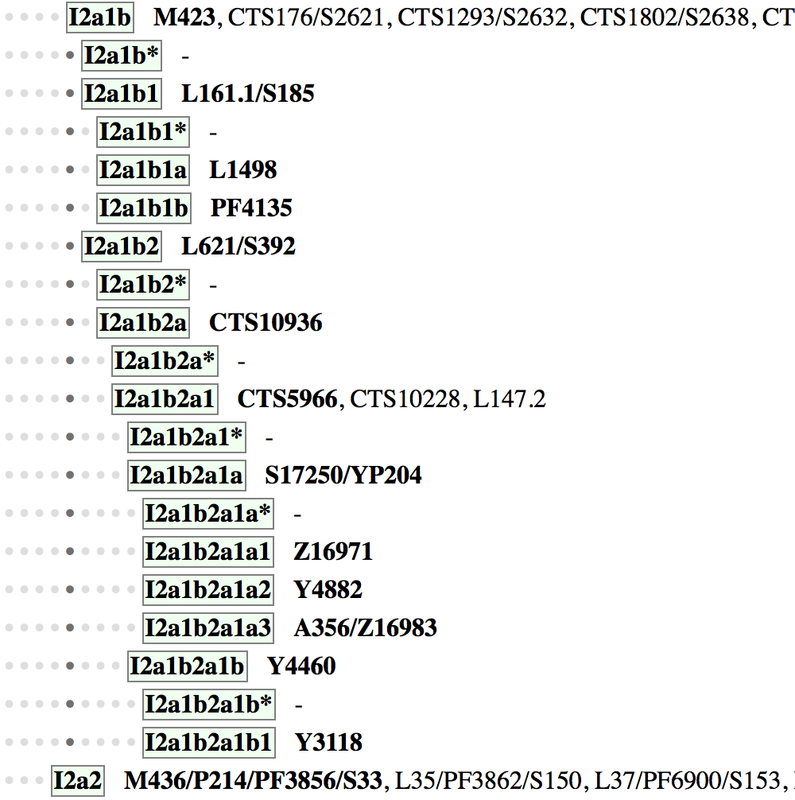 According to large datasets the dominant Bulgarian Z17855 SNP is even absent in north Slavic DNA projects. The rest ~2% of Bulgarian males belong to the subclade M223 (I2a2a). TODO: research above text more. 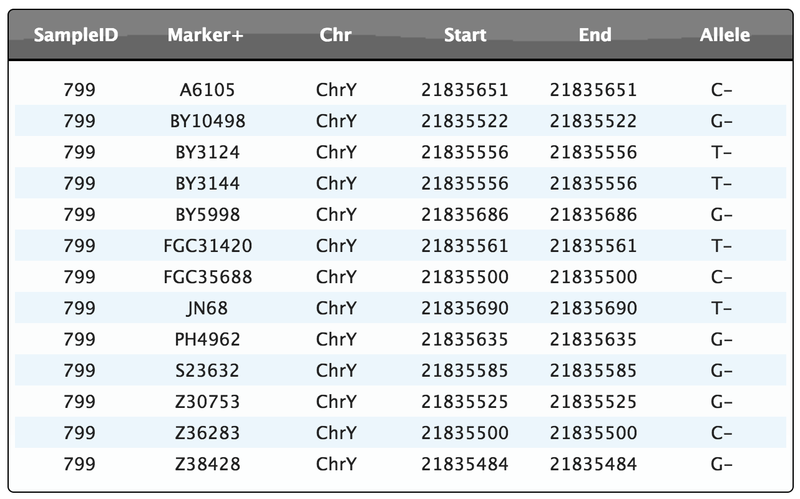 This is screenshot from FTDNA site, data is not changed very frequently, which is bad. 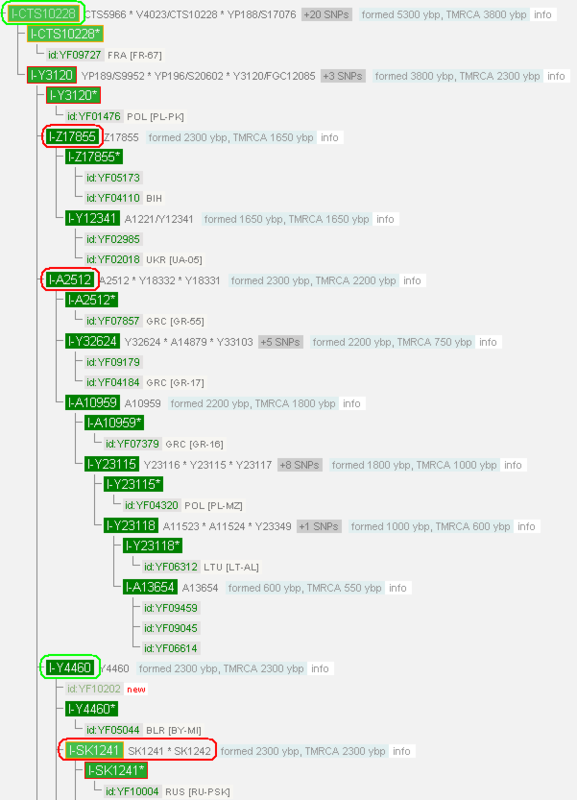 Green color means that haplogroup I-CTS10228 is confirmed (Since this SNP has many people tested/confirmed haplogroup named by name of main SNP). 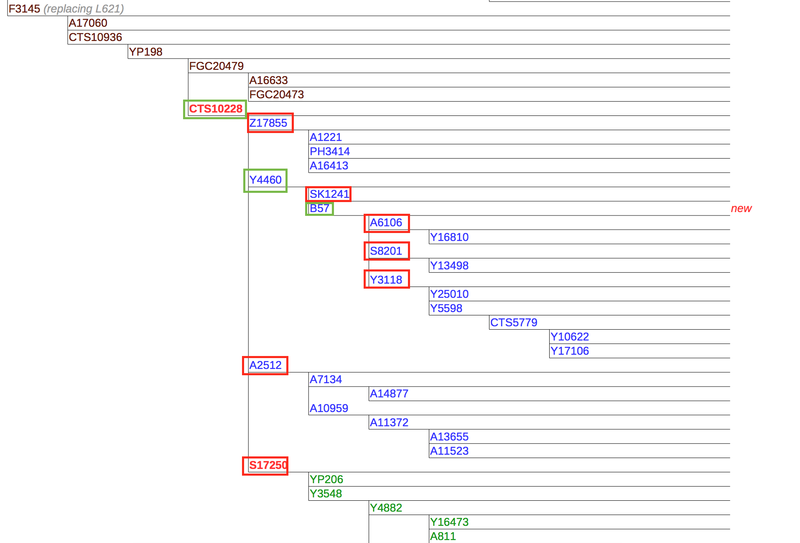 Previously I have I-P37 as only predicted haplogroup, but in red color. Now it’s 100% I-P37, because it’s ancestor for I-CTS10228. Nov-2016: FTNDA still doesn’t give ability to order A6105 or A6106, so I ordered it via YSEQ (see below). Besides FTDNA service, many other services keep up to date haplogroups information. YFULL service is the fastest and the latest always. Since 2014 year, L621 branch grew up, I remember the time, where there was ONLY L621. Then CTS10228 appeared, and then Y4460 appeared. Below I collect data since 2014 till 2017. Green ellipse is about my tested markers, where I am positive. Grey but solid – it’s very probable I’m negative to that marker/SNP. Old versions: L621 (Jun-2015), L621 level (Aug-2015), CTS10228 (Aug-2015), CTS10228 (Jan-30-2016). UPD yfull tree v5.05 Jul-30-2017. M429 -> M170 -> M438-> L460 -> P37 -> M423 -> L621 -> CTS4002 -> CTS10228 -> Y4460 -> (? Y3106? B57?). And, Jun-25-2017, I published dedicated article to Y4460 aka I2a1b2a1b. All Y4460-related information will no be published/updated there. L621 updates: Dec-04-2014, Jan-2015, Apr-2015, Aug-2015, Nov-2015, May-03-2016, My Y4460 cut.png, Aug-28-2016, Dec-31-2016, Feb-19-2017, May-2017, Jun-2017. light-green is about Dinaric-North cluster, brown color is a about Jewish cluster. light-violet is Mediterranean (Greek) cluster. On bigger format there is also Dinaric-South colored cluster, which has now dedicated SNP – PH908 (sub to S17250). Plus, there is great google map, created Oct-2015 by Krzysztof Narog. First of all, here is good example of explanation what is SNP and what is STR, and why we need both yet. There are a few online services, where you cane use this names and numbers and analyze your Y-Chromosome. I know many new discoveries were introduced by Bernie Cullen in I2 haplogroup public email. To get more clarity here is part of public accessible email correspondence between Bernie Cullen, Kennet Nordtvedt and whole I2 Haplogroup community. I2a1b (I2-Dinaric) and also to I2-CTS10228 well known as “I2 Dinaric North” (but except S17250). Dinaric-North has DYS448=20 and DYS449=32 or similar, and is usually found in northeast Europe. Dinaric-South has DYS448=19 and DYS449=30 or similar, and is usually found in southeast Europe. The vast majority of I-L621 men belong to a group called Dinaric, which has distinctive STR markers (especially DYS565=9). Dinaric is very common in Eastern Europe and present at much lower levels in Western Europe. So, as I see, I have DYS448=19 but DYS449=32, which doesn’t fit above !!! May-2014. Initial Bernie Cullen email. Around 12 Dinarics have tested S17250 as part of Big Y or at YSEQ. All 5 Dinaric-South men were S17250+, and some Dinaric-North men were S17250+ and other Dinaric-North men were S17250-. The division between Dinaric-South and Dinaric-North is based on two STR markers and this division is not always a perfect reflection of genetic history. May-2014. Lawrence Mayka replying to Bernie Cullen email. So far, most or all of those who are negative for S17250 have patrilineage originating near the Carpathians, particularly southeastern Poland and extreme western Ukraine. That pattern may change with more sampling, of course. –P41.2/M359.2 is very rare and none of these Big Y testes are derived. 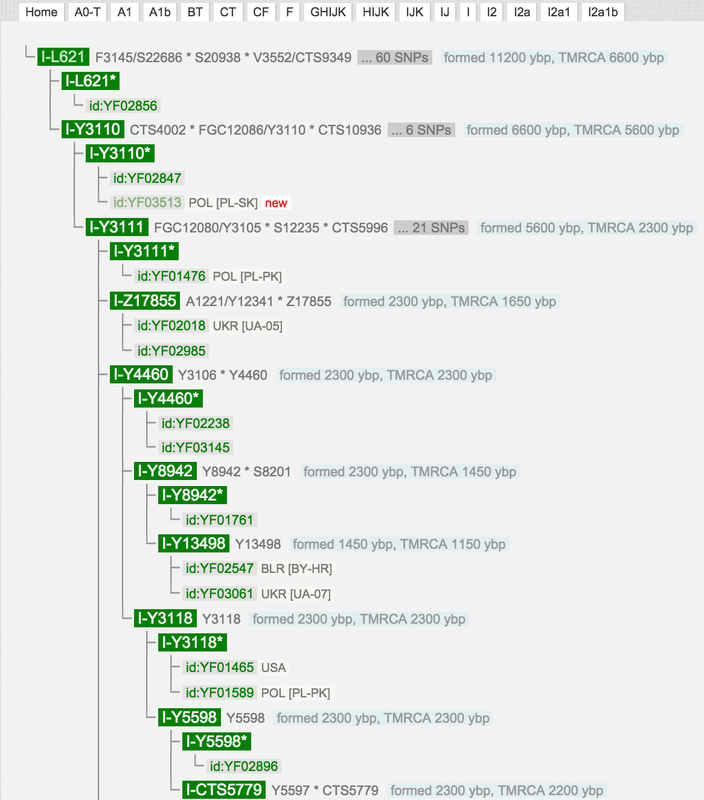 The I-CTS10228 “Dinaric” haplogroup is very large and many new SNPs and branches have been discovered in the past 12 months. I-CTS10228 “Dinaric” is a young group and its members share a lot of history. Older groups like I-M26 and I-L161 are more like collections of ancient lineages that have been living in the same part of the world for many thousands of years, and I think it’s somewhat arbitrary to talk aboutI-M26 vs. a more specific group like I-L160 or a more general group likeI-CTS595. it’s just that I-M26 was discovered first. But the I-CTS10228 level looks like exactly the right level to talk about when you want to talk about the lineage of I-P37 which rapidly expanded in Eastern Europe in the last 2,000+ years. Republic, Slovakia, Serbia, Bosnia, Montenegro, Croatia and probably many other countries.There are many known subbranches of I-S17250, and many of the Dinaric-S people belong to the I-Z16983/A356 branch. I-Y4460 is less common, and so far its members have ancestry from NE Europe: Poland, Ukraine, Latvia, Finland. We know some subbranches ofI-Y4460. I-Z17855 which as far as I know includes one man with ancestry from Greece and one with ancestry from Ukraine. May-2015. And besides well known BigY test, YSEQ company/service have recent update by introducing M423 panel. Colors don’t reflect any my tests. It’s just for visualization. Y3110 is on the same level as CTS10936. Y3111 is on the same level as CTS10228 and CTS5966. 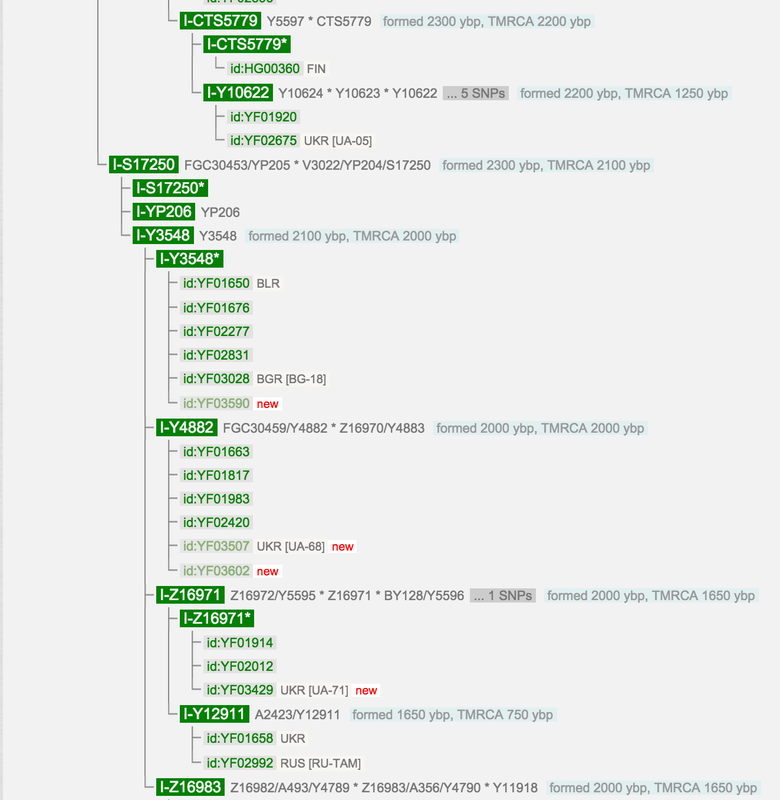 There is a I-L621 draft tree from April 2015 and newly discovered branches below I-CTS10228. It seems that STR based Dinaric Southerns belong to the cluster below S17250. There are also some Din-N subbranches below S17250. There is no SNP which unify Din-S. Instead, there is starlike expansion of Din-S cluster. There is similar situation in some other haplogroups which experienced a sudden and rapid expansion. Almost everyone in I-CTS10228 belongs to one of three branches: I-S17250, I-Y4460 or I-Z17855. But there are a few people who are CTS10228+ and S17250- Y4460- Z17855-. We now know that there is a fourth branch called I-Y2512. Two people have done Big Ys which show that they belong to this group: kit 4605 from the “Jewish Dinaric” cluster, and kit N80837 who has Greek ancestry and is part of the Mediterranean Dinaric cluster. Kit 54093 has also received Y2512+ results from YSeq, he is also part of the Mediterranean Dinaric cluster and more specifically the New Mexico Dinaric cluster. Finally there is an anonymous sample (GS000018440-DID) from Chuvashia that was sequenced by the Estonian Biocentre and found to belong to I-Y2512. Again, I am not the best person to answer these kinds of questions. But I think all of I-CTS10228 “Dinaric” was part of the Slavic expansion, and maybe some people think it was also part of some slightly earlier expansions. I-Z16971 group shows this: we have members from Russia, Serbia, Czech Rep. Slovakia, Ukraine, Poland, North Caucuses. So probably I-Z16971’s paternal ancestors came to Germany from the east. For the eastern parts of Germany, maybe in some cases the I-CTS10228 people were already living in regions that later became Germanized. And in other cases I-CTS10228 people moved west into German speaking regions. … there are other project members who have I-Y4460* result. Some of them have or are expecting Big Y results. Maybe we find another branch, maybe not. FTDNA does not offer A6105, Y8942 SNP tests. A6105 is available at YSeq.net. I2a-A6105 group has a few characteristic STR values which you do not have. It is better to wait until eventually new branches below Y4460 are found. What is I-S21825? It is all of I-P37 except I-M26 and I-M423. That means I-S21825 includes the rare I-L233 “Western” branch and the much rarer I-Y11949 “Alpine”, I-L1294 “France”, and I-L880 “Northern France” branches. 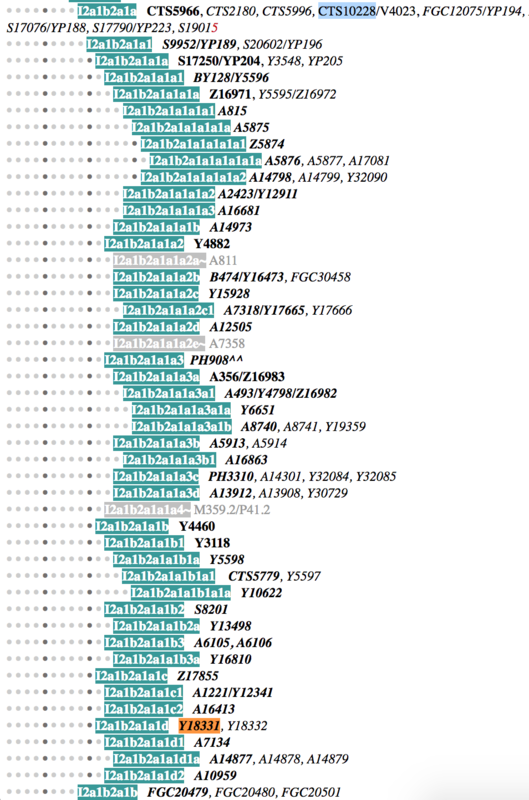 P37, M26, S21825, M423, L621 and L161 each have dozens of equivalent SNPs, but CTS595 is the only known SNP at its level. Therefore I-P37 split into three branches almost simultaneously (into the I-M26, I-S21825 and I-M423 branches). Feb-24-2016. I found interesting web site “MorleyDNA.com Y-SNP Subclade Predictor (beta since 2013)”, where I can provide list of SNPs and see predicted haplogroup. Format: “CTS10228+, Y4460+, S8201-, Y3118-, Z17855-, S17250-“. And here is how page result looks here. Mar-11-2016. 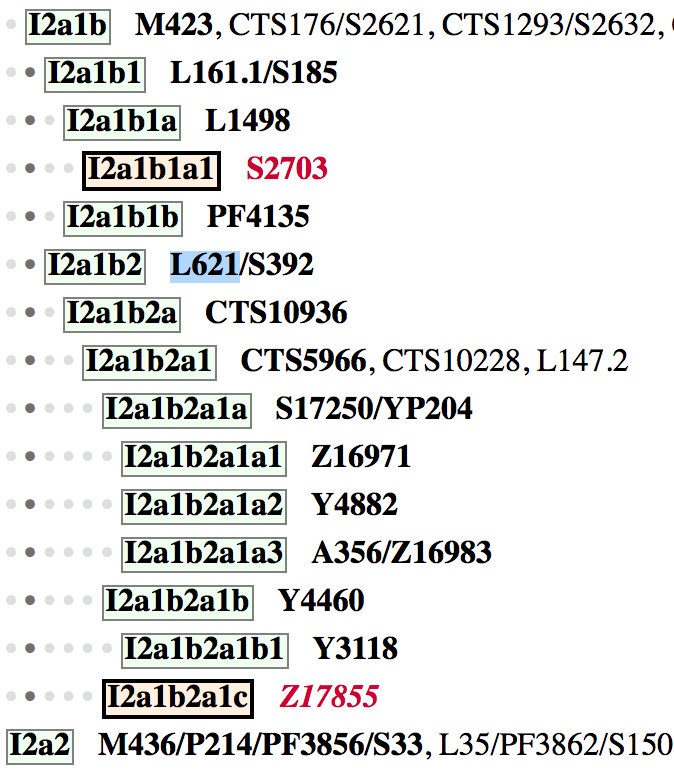 YSEQ released new version o I2-M423 panel (set of SNPs which are closely related. Not all listed on below images !!!). Here is snapshot of Mar-2016 set of SNPs. 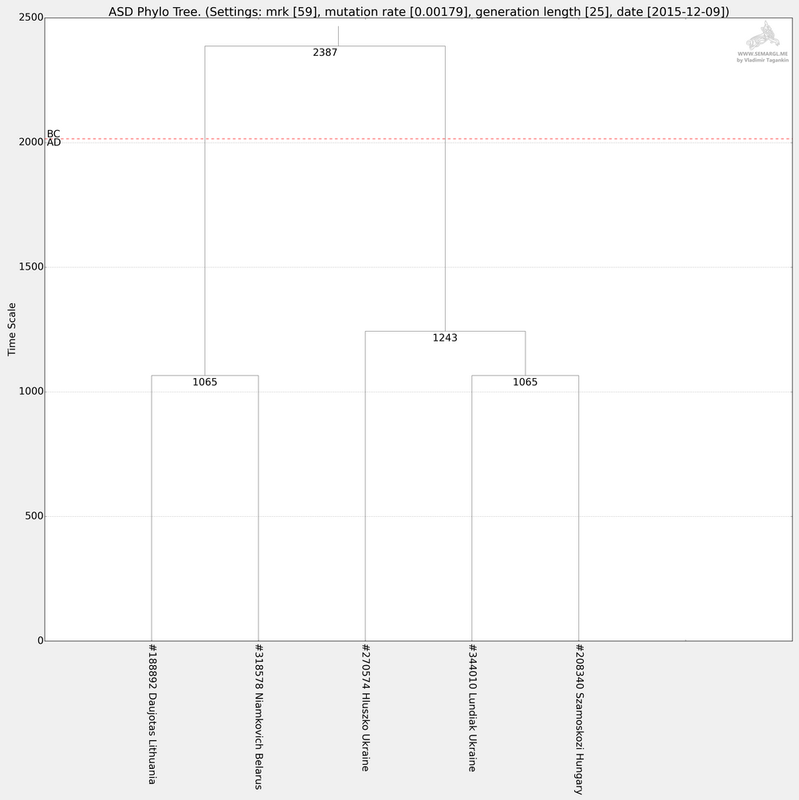 First four persons from I2a-A6105 group have DYS19=17 as a characteristic value. You have DYS19=16. Recently, we received one A6105+ result with DYS19=16. At the moment we can call that group I-A6105 or I-A6106 because both SNPs are at the same level. Ken’s Disles is L621+ but CTS10228-. You could call some Disles men I-L621* and others I-CTS4002*. Ken’s Dinaric group is I-CTS10228. 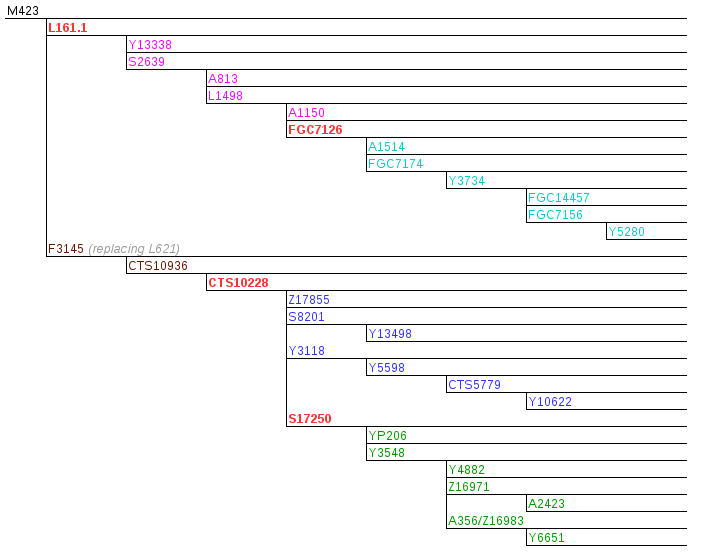 Ken’s Dinaric-North group is complex and belongs to many different branches of I-CTS10228. Ken’s Dinaric-South group all belongs to the more specific I-S17250 branch. But this branch also includes some Dinaric-North men. Ken identified a Jewish Dinaric cluster (in Dinaric-North), we now know that these men are part of the I-A2512 branch and aren’t closely related to most other Dinaric branches. 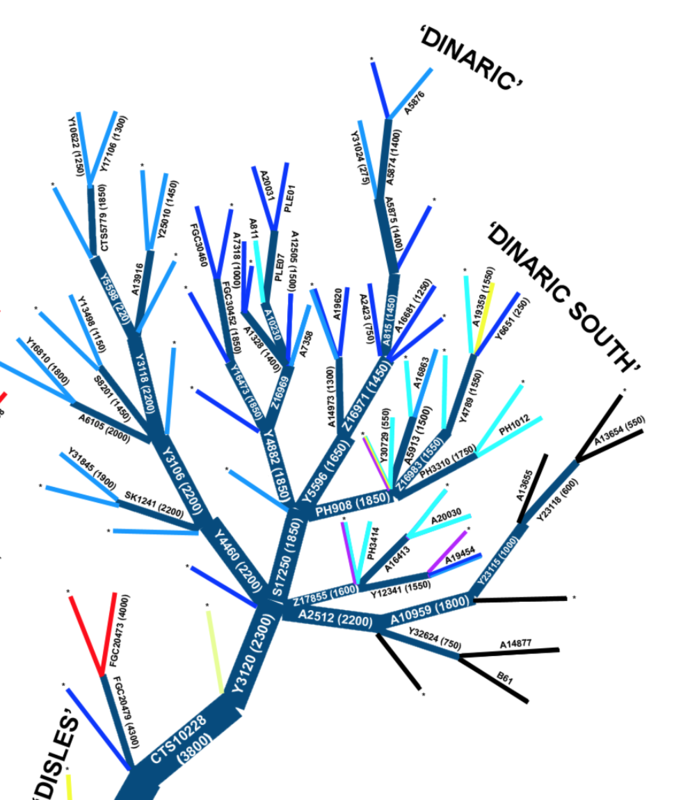 … tree shows that the Dinaric-South group belongs to the I-PH908 branch. PH908 is a SNP that was first reported in the Pille Hallast survey in 2014. This SNP is not covered by the Big Y test and most those who have Big Y test result have no call status for PH908… PH908 could be a characteristic SNP for the Dinaric South cluster. So far it seems that A6105 and A6106 are at the same level. That does not mean that those SNP mutations happened at the same time. We do not know which is older because all persons who had tested both A6105 and A6106 received both positive results. I would recommend that you test one of these SNP. The Dinaric-South group is defined by the STR marker values DYS448=19 and a low value for DYS449 (for example DYS449=30). We now know that the Dinaric-South cluster is defined by the SNP called PH908. The Dinaric-North group is defined by the STR marker values DYS448=20 and a high value for DYS449 (for example DYS449=32). The Dinaric-North group is more complex and there is no single SNP that is specific to Dinaric-North and which excludes Dinaric-South. Nov-05-2016. YFULL updated I-Y4460 tree, and new parent branch appeared – I-Y3106, which now contains Y16810 (A6105, A6106), S8201, Y3118. Looks like there is some common Y-DNA characteristic for all of mentioned SNPs. So far I’m negative for all of them. So I may assume, that 50% I have some original Y-DNA on the very top level of Y4460 or some child branch has not been discovered yet. Nov-11-2016. My YSEQ M423-Panel results shows me, that I’m also positive for CTS10228 neighbor branchV4023 but negative for A6106 as a child branch of Y4460. Here is latest on Oc-22-2016 (when I ordered panel for sale price). And here is Nov-2016 updated full panel SNPs(actual update date Oct-31). … those who have Y4460+ result in their Big Y test results also have Y3108+ result. Those who are in the I-Y4460* haplogroup could test Y3106. It is not available at YSeq, but they can put it in their SNP list through the Wish SNP order. 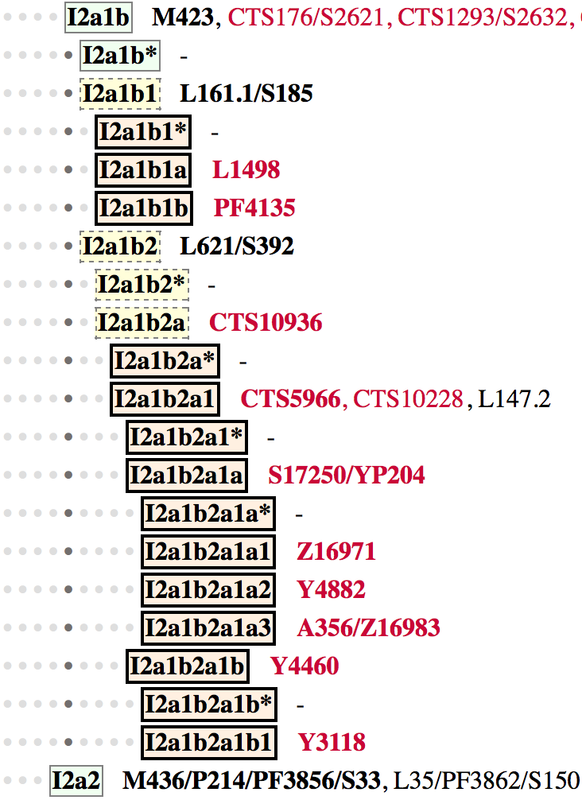 … there is also the fourth shared novel variant in the DYZ19 repeat region. … I-A2512 people from Belarus and Ukraine are from Jewish diaspora. They belong to the more recent I-A11372 subgroup (or I-Y23115 in the YFull tree). Interestingly, all other I-A2512 (xA11372) participants are from Greece. I-Y4460 dedicated updates are posted in dedicated article, here on my blog. 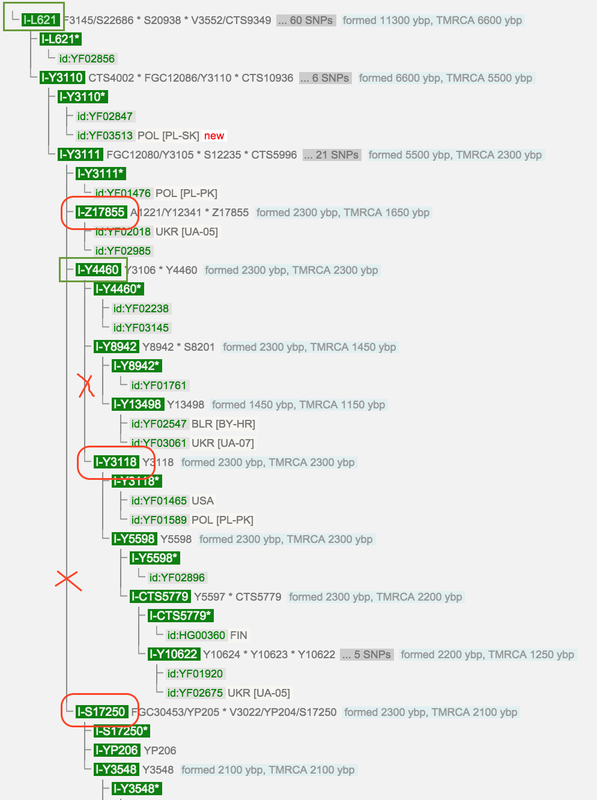 BigY results explained for Mr. Back (YF08522), Undefined Belorussian man (YF05044 – Yurkevich ? ), new branch ERR1025605 (Vologda region in Russia). … there is a second CTS10228+ A2512- Y4460- Z17855- S17250-, this man has paternal ancestry from Alsace (southwestern Germany/France border area, now part of France). The Polish-ancestry and Alsatian-ancestry man don’t share any unique novel variants/SNPs. Jun-13-2017. 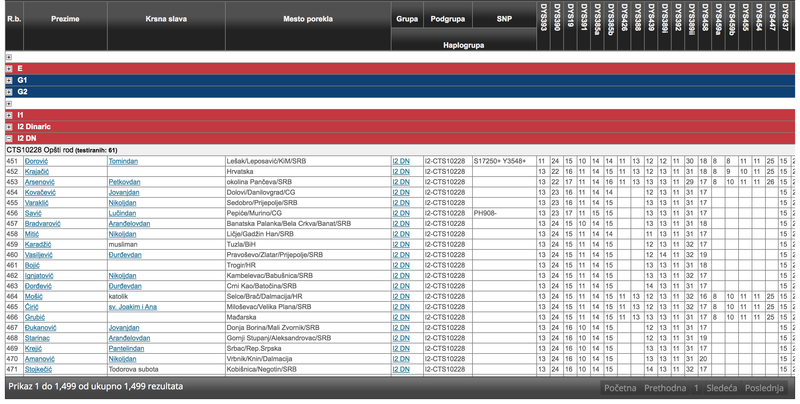 from FTDNA I2a-hap-group “Yurkevich BigY update info. Not very clear”. Note: I have DYS565 = 9. The marker value DYS561=15, Zdenko noticed that this marker splits Dinaric-South into two groups, most Dinaric-South men have DYS561=16. Aug-20. 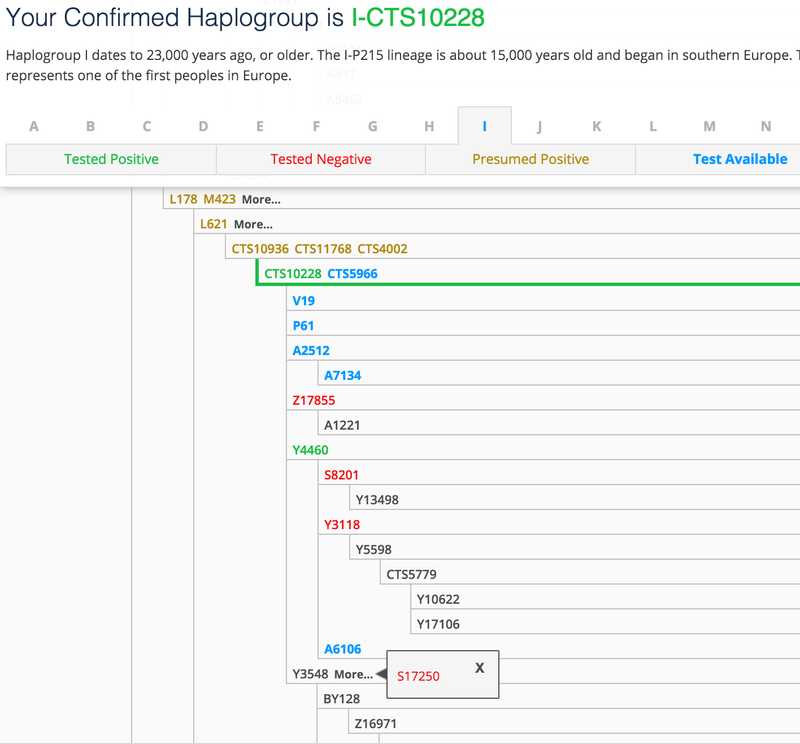 Major update reorganize entire haplogroup I2 tree. Dinaric South (I-PH908) is most common in Bosnia and Herzegovina, Serbia, Croatia and surrounding areas. But when we find Dinaric South men from other parts of Europe (Italy, Germany, Czechia, Poland, Ukraine, Russia), very often they belong to I-A356, I-A5913, or I-Y32084. These three branches have the distinctive marker value DYS561=15 (Mr Balzano has DYS561=15). And these branches also contain some men from Bosnia and Herzegovina, Serbia, Croatia and surrounding areas But most Dinaric South men from Bosnia and Herzegovina, Serbia, Croatia and surrounding areas have DYS561=16, and often they belong to I-PH908* which means they don’t share any variants below PH908 with any other Big Y result. But now more men have done Big Ys, and we are starting to find branches below I-PH908 in the DYS561=16 group, for example the I-Y144303 branch. Note: I ordered Y111, and I have DYS561=15 (Sep-2018). 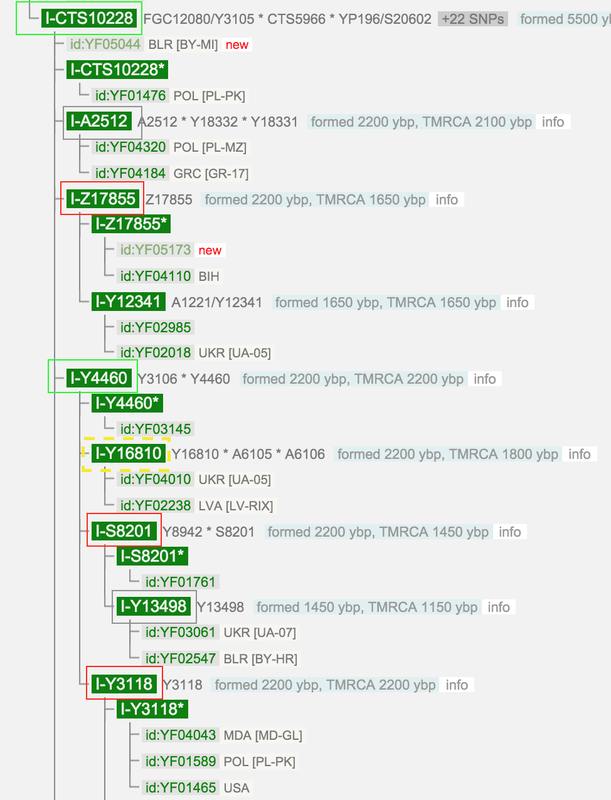 Looks like Y4460 may represent Vistula Venedi ancestry (2016 theory). More details in my new article about Y4460. Research S17250 and PH908 in regards to Croats, White Croats, and as Carpathian ancestry. Dec-31-2016 L621 update on i2aproject shows colorful separation between L621 sub branches. Aug-2018 also significant split in PH908 branch found. 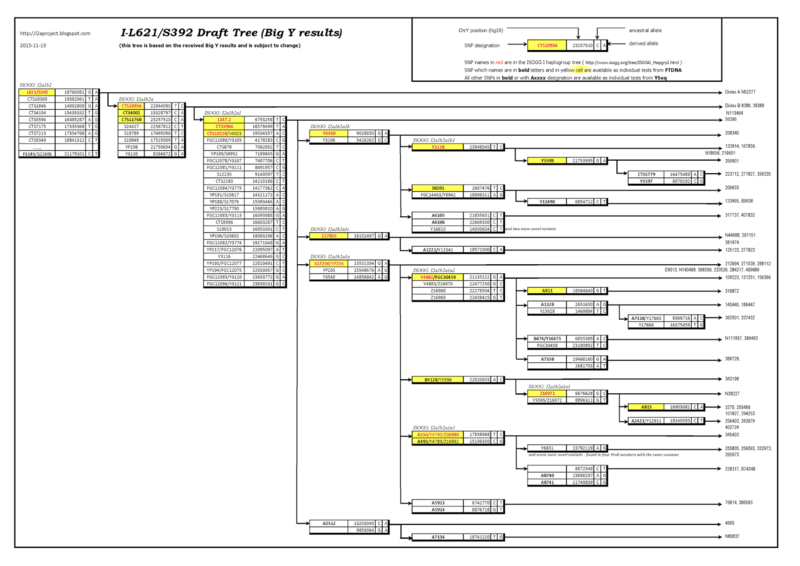 ISOOG and YFULL keep all the time tree updated with new SNPs. FTDNA keep watching on them, but website doesn’t reflect all latest changes, which is bad. Research Dinaric race and historical research of whole Balkans plus Eastern-Europe and I2 haplogroup subclades is still relevant, but since S17250 is not my direct ancestral SNP I left this research for later. I received mtDNA results time ago -> “H” haplogroup (maternal line), and my mother’s results defines here as H13a1d member. Here is my new article about analysis. Anyway there are many items to research, which may help me to clarify intersection between races, and locations and different ancestral directions. Besides Y-DNA and mtDNA tests, I made atDNA test via FTDNA (Family Finder test). More details here and here and here. A Journey back to the root. Andrii, I just received my Y67 results recently also. The Haplogroup Predictor has me 100% I-P37.2, I 423 Dinaric North 91% and South 9%. We are very close to the same tribe. All of my relatives claimed to be Polish but my paternal lineage is traced back to Khrabuzna, Khmelnitsky, Ukraine. I just tested at YSEQ with S17250+ and have a BigY results coming this month some time. Why do you suppose there is so little said about our clade on line? R1 seems to get the lions share of the focus. Thanks for posting your information. What exactly do expect to have more about clade? 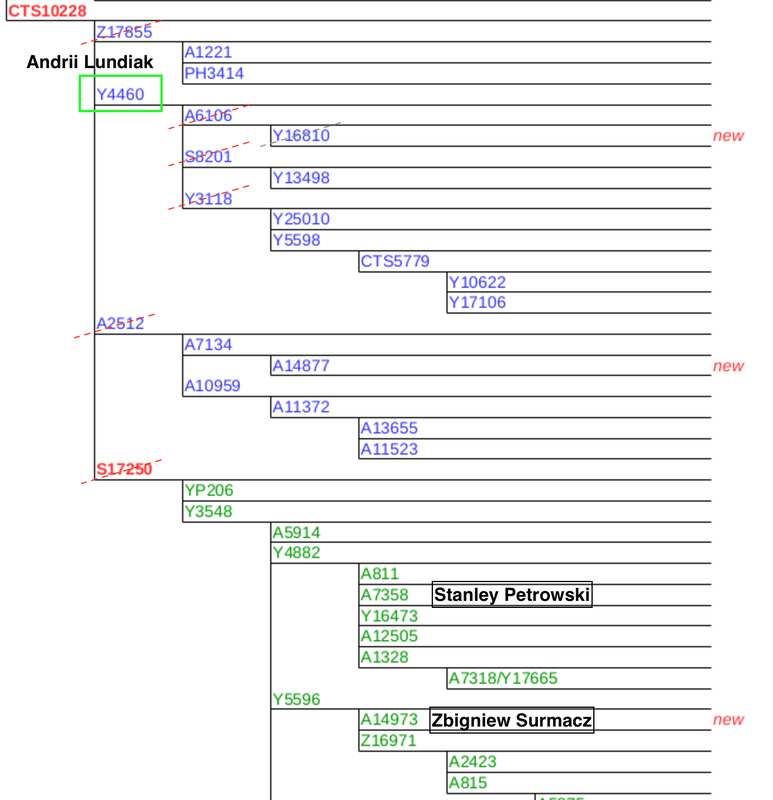 My bigY results place me in Y-4882 subclade of I-CTS10228. http://www.yfull.com/tree/I-Y4882 ID-YF03507UKR [UA-68] and I2a1b2a1a2. 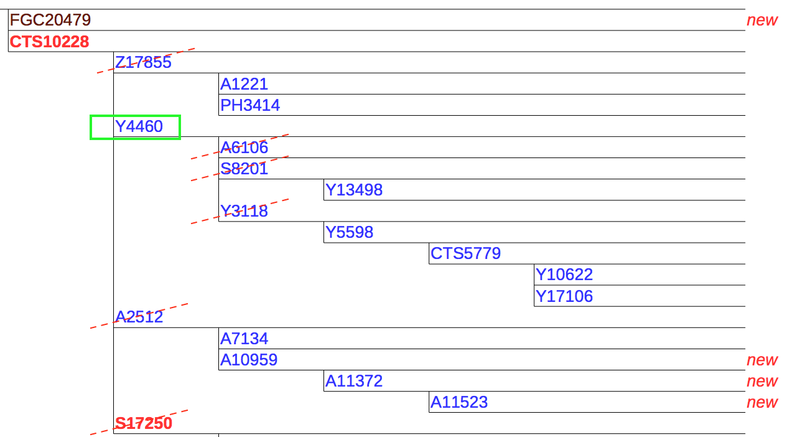 My YFULL analysis is due June 6 so I am excited to see the final subclade in the TREE. 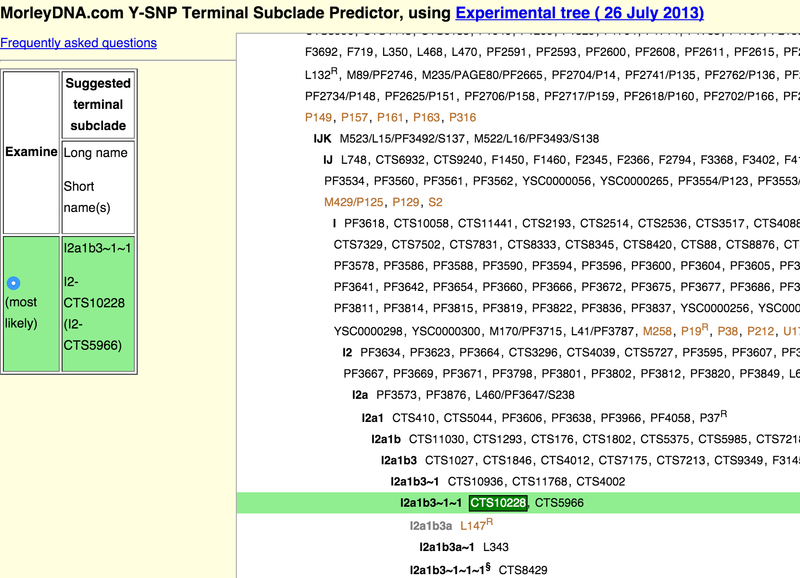 Despite Y-4882 is subclade of S-17250 (which I negative for), please keep me posted what Jun-6 will bring you. It’s matter of interest what YFULL analysis gives for research. I’ve never tried with YFULL. For me it’s only resource to see recent tree. I will most certainly keep you up to date. Thank you for your interest. Thanks for the reply. I had not seen your previous post. I just translated it from google translate and it is informative. There is a huge debate that has developed regarding I2a that it did not come from Southern Europe but from South Siberia. Also, there is very little said regarding Polish Ethnicity in these studies and I am curious why that is so. I think part of the reason is that when I google my suspected clade (which now is I2a1b2a ISOGG) most of the remaining hits are in Cyrillic which I do not know. Thanks for your time and effort. Well done. I somewhat agree with you. But I’m not so close in this direction of research now, but anyway I have in my plans. Currently I relocated to Krakow (Poland) so sooner or later I will continue my research. If you have any questions related to Cyrillic, u can let me know via facebook or my email (LANDIKE @ GMAIL.COM), I may help you. I am at I-CTS10228 also. Since I published this post, subclade I-CTS10228 (one of parallel subclade with I-L621) has been changed with new branches and changes. Friends, I-Y3548 is White Croatian mutation from southern Poland…Croats have I-Z16983 I2a1b2a1a3 A356…This means that migration of Croats from White Croatia went in more directions…After Croatian I2a1b2a1a3 A356 there are new mutations in Czech Republic…That are Croats fled from Turks five hundred years ago……I-Y4882, I-Z16983, I-Z16971, I-Y3548* mutations are White Croatian origin…It is in branch I-S17250… Greetings from Croatia..
@janko thanks for this info. Because I’m S17250-, now (assuming you are right and correct) I assume, that my great-grandfather (~1780b) was not White Croatian. Theoretically behind your I-L621 excluding mutation I-S17250 are mutations which exist in the time of White Croatia or White Croats….but needs to see where their previously mutations are in the Poland or Ukraine …. if they are somewhere in north Poland or Germany they would not be considered as White Croatian origin..
As I updated blog with pos/neg SNPs, it’s based on tests from FTDNA. That’s it. Yes, CTS10228 (main green postive marker for me) is on the same level as L621 for now. But sooner or later they will go into different branches. For me and the same as for for Croatians and for many Polish and Belarusian and Ukrainian people, “I-S17250-” that we have the same ancestor. So the questions is from where he was, and where was located and spread afterwards. 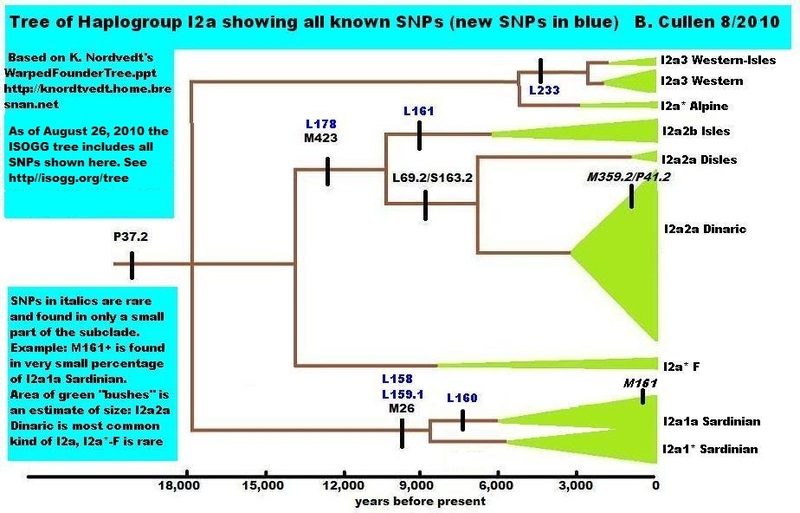 So if I am negative for S17250, I will be negative for all subclades/SNPs. 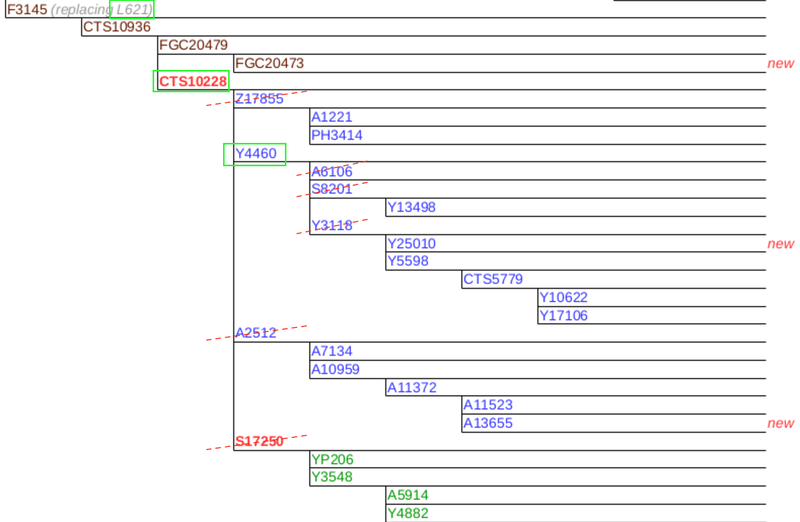 And I only wait for FTDNA/YFULL/YSEQ to extend all possible information about SNP structure. I do wait for Bernie Cullen suggestions what next SNP I can pick up, for additional testing, if FTDNA needs for deeper research. Provided link shows me diagram of movement, which I researched time ago, as I stated in my previous blog entry to related topic (linked in this topic at the beginning). 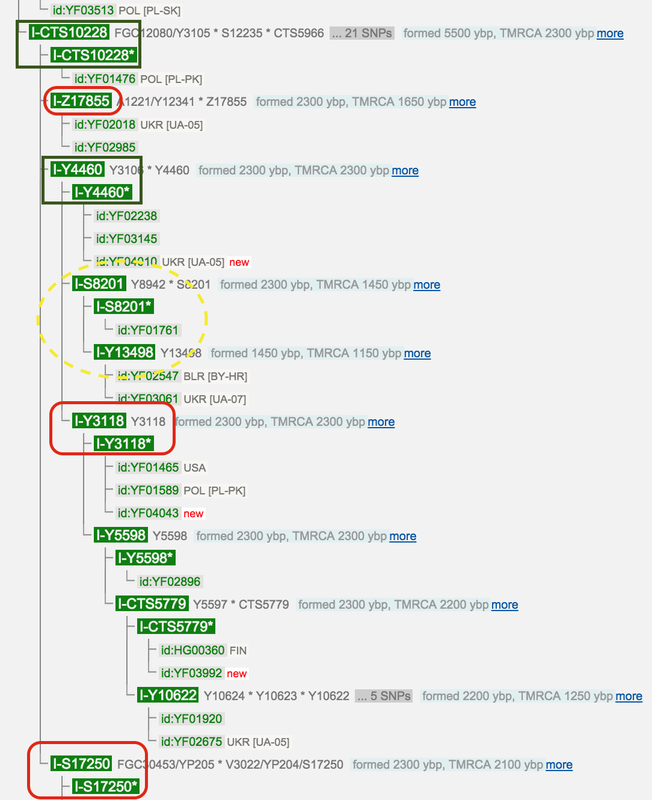 And what is really on waiting status in haplogroups community – is “Yamnaya” full analysis. 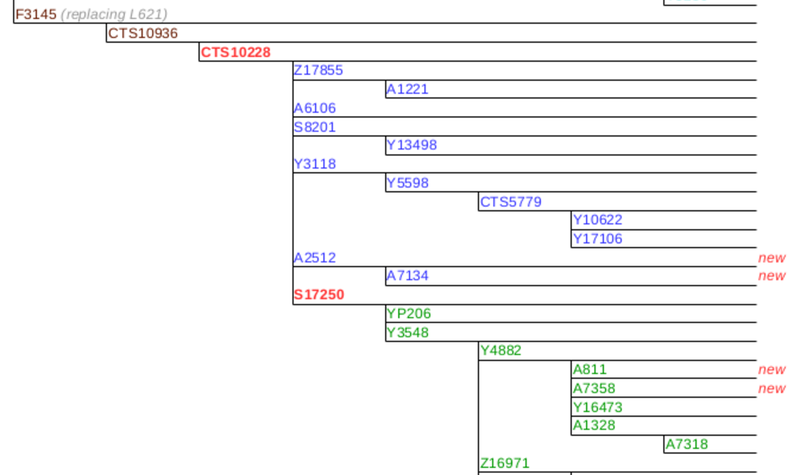 Logically I conclude that somewhere here is your final haplotype becouse you are positiv for I-Y4460…. Please pardon my naivete. I was looking through the dv3 analysis image and noticed that there isn’t an annotation for anyone that is Polish. I have noticed this in other documentation also. It is a curiosity to me. Have you noticed this proclivity elsewhere also? So please follow it for more details. Whole blog I mean. Exactly this blog entry/post has almost nothing in common with dv3 analysis. But yes, there is Corded Ware, Eastern Europe (RU, UA, BL, CZ, HG) but no Polish. Hi there. Have you tested the S8201 SNP? I’m also S17250- and Y4460+ and waiting for result, but I’ve not tested the Z17855 and Y3118 yet. So I forecast some changes here, in future. I just received a positive result for Y4460 for my male line that I am researching from Latvia. (Also S17250-). Just saying hello and thanks for providing all the reading resources here in your blog! I’ll be following for new developments for our haplogroup! Based on L621 map, looks like line Ukraine-Belarus-Latvia-Lithuania is kinda region I may have something. Oh, good to know, thanks! It looks like there are two different and still “undiscovered” branches under Y4460: the first one is mine + Daujotas from Lithuania, and the second one is yours + two guys from Ukraine and Hungary. Although it’s just STRs and the number of samples is too small for any conclusion to be drawn. I’m still waiting for Big Y result and I’m going to order the analysis on yfull.com to get as many information as I can. … as you may have noticed, there are other project members who have I-Y4460* result. Some of them have or are expecting Big Y results. Maybe we find another branch, maybe not. FTDNA does not offer A6105, Y8942 SNP tests. A6105 is available at YSeq.net. I2a-A6105 group has a few characteristic STR values which you do not have. It is better to wait until eventualy new branches below Y4460 are found. I also wanted to thank you personally again for inspiring me to put together a blog of my own on the topic. @Stanley, you are welcome. Glad to help in any possible case/method. In my case I’m negative for Y3548 aka S17250. And so far, I wait for some time, so more bigY results come around. The nearest test I would take is A6106. 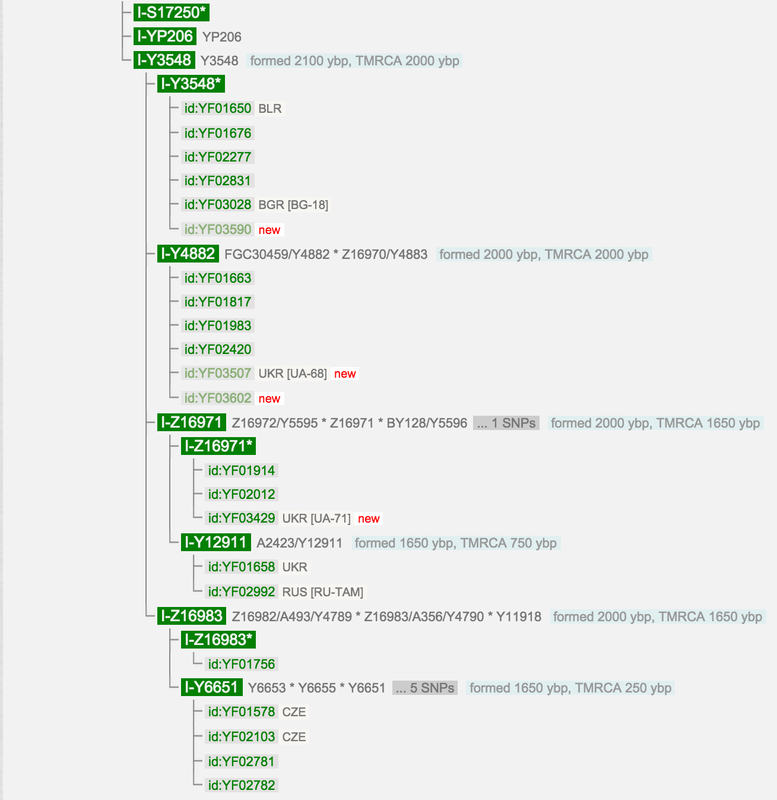 As far as I see from http://yfull.com/tree/I-Y4882/ A7358 has no representation yet. IMHO, it would mean stable meaning that marker exists and able/suggested to use. But I’m not specialist in this area. 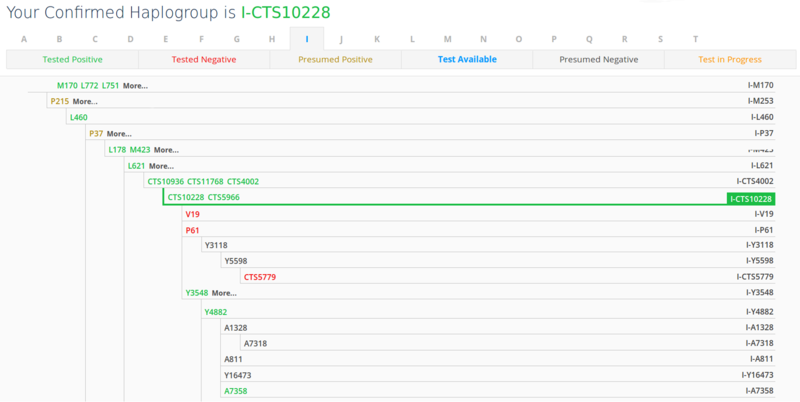 In regards to I-Y4460, where I’m positive, the only one new test is A6106, and I am not in a hurry to take it. Although FTDNA has it as visible on page and available, for me it’s not selectable. And I can’t pick it up by Advanced order/search. So I think I will wait some time. In regards of YSEQ, I guess I have to pass DNA material to them, so they can test me, and I don’t have such plan. I stick with FTDNA instead. A7358 not for me, but as far as I see, now it’s official SNP, but still not available on FTDNA. Did you notice where they are replacing L621 with F3145? I found that a curiosity and had not seen it before. It’s not a big deal, naming changes. It’s normal AFAIK, because it happens. “No matter how you name the car, matters how car is driving …”. And in fact it’s since Jun-2015. 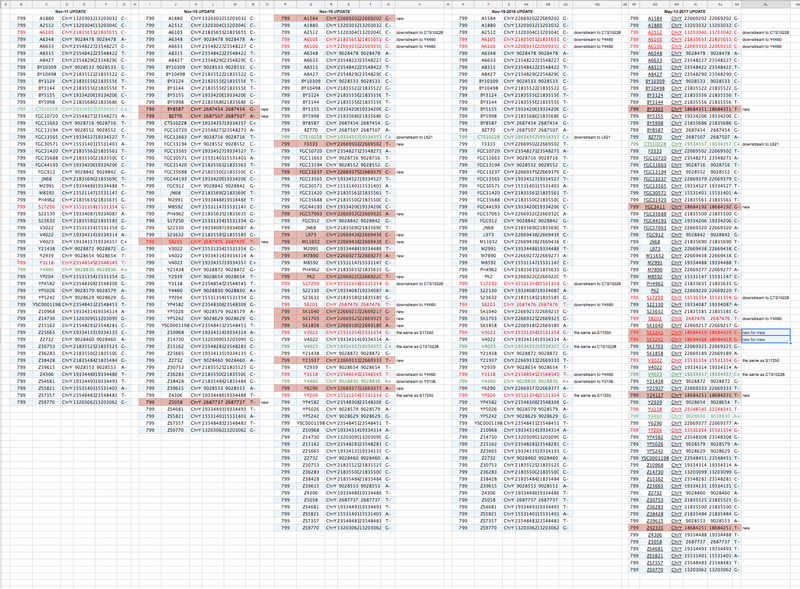 I have locally screenshot (YSEQ_I2a-M423 Panel_2015-Jun.png) so … And besides, it’s YSEQ naming, it’s not ISOGG yet. AFAIK ISOGG is the standard. So what a conclusion ? Do we need to wait to whole population on the World tested and then we will know we are coming from one Adam? Thanks for the update. The latest on my subclade I-A7358. I found one individual in the Slovakia group and two others in the RussianDNA group and one individual who is from Poland. The fact that we are scattered throughout Eastern Europe I suspect the number of clade members will increase over time as you suggest elsewhere in your progress. It is estimated that my MRCA is 1750 to 1500 years ago. Things are moving quickly so your patience Andrii will pay off. P.S. I signed up for MyHeritage this week. I am impressed by the amount of connections I have in Poland from just one side of the family. What amazes me is that I have searched for over a year for individuals with my surname and could find nothing. Now I have them in abundance. Pozdrowienia z Polski od 9 rodzin o wspólnym przodku z przełomu XIV i XV wieku. Hledám pozitivní pokračování SNP větve A815+. Nemáte někdo nějaký nápad? I guess YF01914 is you. I am also I-A815+ and A5875-. I tested myself at YSEQ. 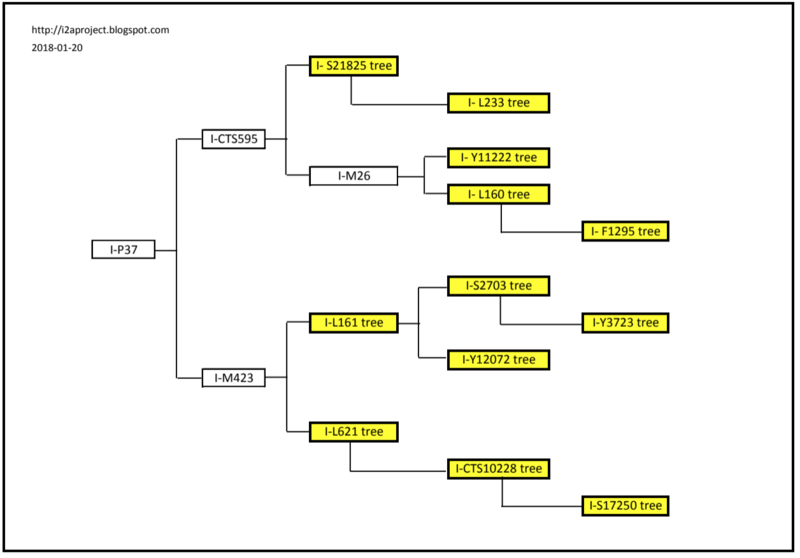 STR haplogroup according to ISSOG ? For example I2a1b2a1a1a1a1. Will we be in permanent contact via mail?